We accept reservations by e-mail only. Please fill and send the form shown below. We highly recommend booking 1 month before. We accept 2 weeks before at the latest. The reservation is limited to the person who can speak Japanese,because the staff who can speak English are absence. For Foreigner who can speak Japanese. Please contact us by telephone if you have a reservation. ・Preferable make-up, wearing and visiting spots for guided outing. ・1st step Please send the reservation form to us. ・2nd step You get an acceptance e-mail from us. ・3rd step Please reply us within 48 hours after getting our e-mail. The reservation is confirmed with that reply. If no reply form you within 48 hours , your reservation is automatically canceled. ・4th step Please arrive at / on location, time listed in acceptance e-mail above. Late arrival may shorten yor service time. If it is the case, we discuss at the counseling time. Just for the case, we inform our telefone number in acceptance e-mail. You would be advised to call us if you have to be late. If no contact in 45 minutes late, your reservation is autmatically canceled. When you want to cancel or reschedule yor reservation, please inform us at least 72 hours before. We accept it without any charge for that case. Please note that we do not accept any reservation if you have a record of no contact and / or no show in the past. Salon opens 11am-21pm almost every days exept irregular closing. 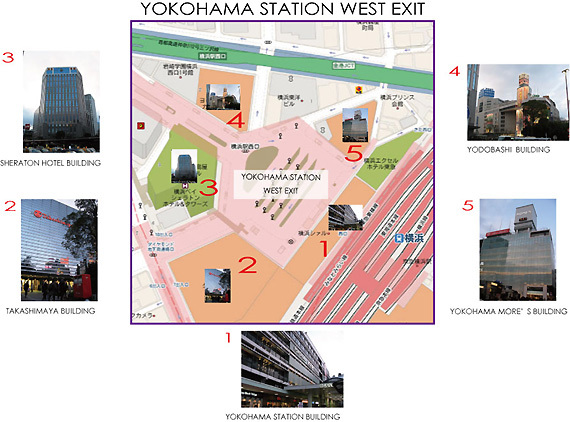 Meeting point YOKOHAMA station west exit. detailed information will be available in acceptantane e-mail above.